Learn in a safe, supportive, friendly environment. Learn Aikido techniques and foundational skills in a step-by-step, helpful, non-judgmental training environment. Practice getting out of the way of strikes or grabs. Start applying basic locks, pins, and throws to neutralize aggression. Become more flexible and powerful as you learn to blend, flow, and use balance and gravity in new, exciting ways. As a beginner, you are welcome to attend your first month (or series) of classes wearing loose, comfortable clothes (long pants, sleeved top). You are also welcome to wear a uniform right away if you prefer. The traditional training uniform is white, and is called a dogi or more commonly, a gi (pronounced ghee). The Sensei (teacher) of this class will discuss uniforms the first week of classes, and can show you the two main kinds used in Aikido. You may purchase a new or used uniform from from Sensei if your size is in stock, or you may purchase a uniform elsewhere. As for footwear, Aikido training is generally done on mats in bare feet. If having bare feet is an issue for you, speak with your instructor about wearing soft tabi or about other options. We welcome you to practice with complexity and depth appropriate to your level. Use more speed, precision, power, and modulation. With experience, Aikido practitioners are able to become more skillful at modulating the application of a technique by learning to feel what they are doing and how their partner is responding (somatic awareness) from moment to moment. Often this aspect of Aikido requires the courage to feel what is and is not working. Although this is challenging for some, the reward is a much more sophisticated level of Aikido. As well-seasoned practitioners know, Aikido is a process, not a goal. It is a mistake to confuse the aim of Aikido (to neutralize aggression with the least force and harm possible) with the more common egoic goal of winning, being strongest or fastest, being better than others, being invulnerable, etc. Official Aikido rank is awarded to Aikido students by Tesoro Sensei, Dojo Cho/Chief Instructor of Aikido of San Luis Obispo, through the California Aikido Association Division Two (headed by Michael Friedl Shihan, successor to Frank Doran Shihan), a worldwide organization directly affiliated with Aikikai Hombu Dojo / Aikido World Headquarters in Tokyo, Japan. 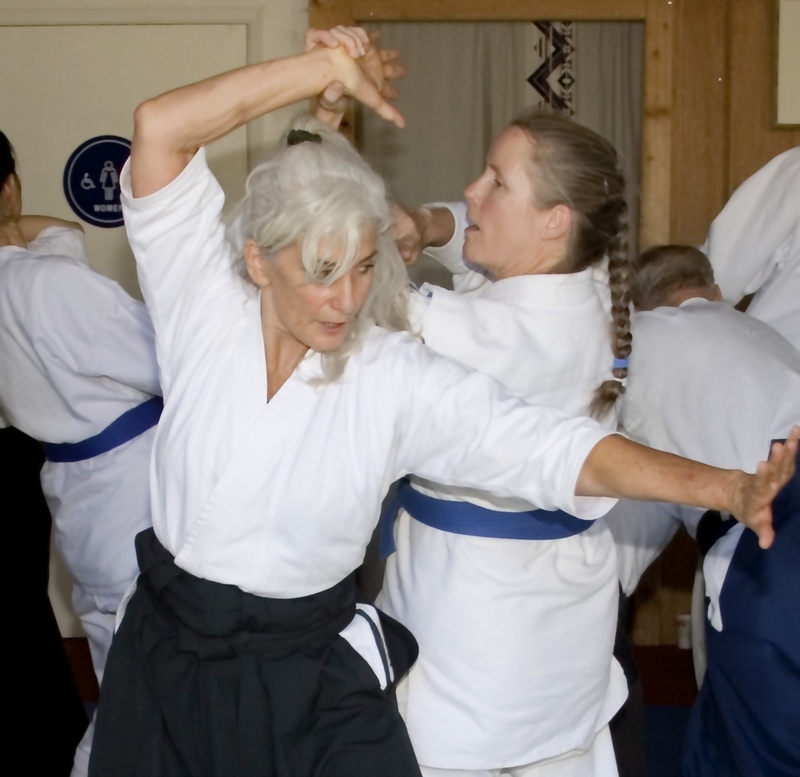 Mary Tesoro Sensei is a 5th Degree Black Belt who has trained continuously in Aikido since 1982. She and Tom Elliott Sensei founded Aikido of San Luis Obispo in 1987. Together and separately, they have instructed thousands of students, many who have gone on to become teachers. Her primary teacher is Frank Doran Shihan.